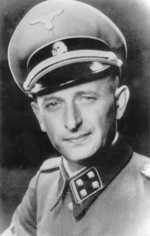 ww2dbaseOtto Adolf Eichmann was born in Solingen, Germany to industrialist and businessman Adolf Karl Eichmann and his wife Maria Eichmann (née Schefferling). In 1914, his family moved to Linz, Austria, after the passing of Maria Eichmann. During WW1, his father served in the Austro-Hungarian Army. He dropped out of high school to pursue a career as a mechanic, which he also quit after some time. In 1923, he started working in the mining company owned by his father, and then between 1925 and 1927, he worked as a sales clerk for the company Oberösterreichische Elektrobau AG. Between 1927 and spring 1933, he was a district agent for the Vacuum Oil Company AG, a German subsidiary of the American firm Standard Oil. While at Vacuum Oil Company, guided by family friend Ernst Kaltenbrunner, he joined the Austrian branch of the NSDAP as member number 889 895 on 1 Apr 1932. In Nov of the same year, he became a full member of the Schutzstaffel (SS) with SS number 45326, operating out of Salzburg, Austria. In Jul 1933, he moved to Germany and joined an active duty regiment of the SS. In Nov 1933, he was promoted to the rank of SS-Scharführer and performed administrative work at the Dachau concentration camp and in Salzburg as a member of the Allgemeine SS. On 21 Mar 1935, Eichmann married Veronica ("Vera") Liebl, with whom he would have four sons, Klaus, Horst, Dieter, and Ricardo. In Nov 1934, Eichmann applied to transfer into the Sicherheitspolizei secret police organization, which was approved. He was assigned to the Sicherheitsdienst (SD) headquarters in Berlin, Germany. In 1935, he was promoted to the rank of SS-Hauptscharführer, and in 1937 SS-Untersturmführer. ww2dbaseIn 1937, Eichmann was sent to the British Mandate of Palestine with his superior Herbert Hagen to evaluate the possibilities of a massive Jewish deportation from Germany to Palestine, but they were unable to acquire a visa from the British authorities upon landing in Haifa. Failing entry, the two went to Cairo, Egypt to meet with Feival Polkes, a member of the Jewish paramilitary group Haganah, to discuss the Zionist plans for an independent Jewish state and the possibility of Jewish emigration from Europe after that success. ww2dbaseIn 1938, Eichmann was assigned to Austria to organize SS security forces in Vienna after the Anschluss annexation; in this capacity, he was promoted to the rank of SS-Obersturmführer at the end of 1938. Around the same time, he was placed in charge of the newly formed Central Office for Jewish Emigration, which explored the possibilities of forcibly deporting Jews from Austria. ww2dbaseAt the start of the European War in Sep 1939, Eichmann held the rank of SS-Hauptsturmführer. He was known to be an efficient administrator in terms of facilitating the deportation of Jews from the German empire. He worked not only with officials in other branches of the German government, but he also continued to reach out to Zionist group leaders, thus able to meet his deportation quotas with ease. Initially, he regretted to see Jews being sent to concentration camps to wither and die, especially considering his earlier attempts to emigrate Jews to Palestine; nevertheless, he never voiced any concerns regarding the atrocities committed against the Jewish people by other branches of the German government and never felt responsible for the death of the Jews who were deported by his men. He was transferred to Berlin in Dec 1939 and joined the Reich Central Security Office, RSHA. As the head of RSHA Referat IV B4, under the direction of Heinrich Müller, he continued to work on the topic of Jewish deportations. ww2dbaseIn Aug 1940, Eichmann released the details of his Madagaskar Projekt, which was a plan to forcibly deport European Jews to Madagascar. Much like his earlier plan to deport Jews to Palestine, this project was also a failure; with a war waging, there simply was little resource that could be dedicated to such a large undertaking, while such long oceanic voyages would be difficult with British and French warships patrolling the high seas. ww2dbaseIn late 1940, Eichmann was promoted to the rank of SS-Sturmbannführer, and then SS-Obersturmbannführer less than a year later. In 1942, at the Wannsee Conference where Germany's anti-Semitic measures became policy, he served at the conference as the recording secretary, and was given the role of Transportation Administrator of the Final Solution to the Jewish Question. ww2dbaseIn 1944, Eichmann was assigned to Hungary after Germany occupied that country and was given the task of removing Jews from Hungary. 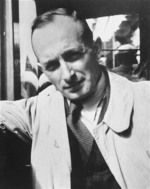 He was approached by Hungarian Jew Joel Brand for possibilities to save Hungarian Jews, and the proposal that the two came up with was that Eichmann was to release up to 1,000,000 European Jews to the Western Allies if Germany was to be given 10,000 trucks and supplies of soap, tea, and coffee; the Western Allies ignored this offer. Between his arrival in Hungary and the arrival of the Soviet forces, 430,000 Hungarian Jews were transported by his office to concentration camps, where they would perish. ww2dbaseIn 1945, as a German defeat became a possibility, SS chief Heinrich Himmler ordered Jewish extermination to be halted, and all evidence to be destroyed. Eichmann disobeyed that order and continued his work, stopping only after being called to meet with Himmler face to face in Berlin. ww2dbaseThroughout his career with the Nazi Party, and especially during his time in Hungary, Eichmann had kept a great secrecy about himself so that, should Germany one day fall, it would be more difficult to pinpoint his responsibility in the Holocaust. To this end, he avoided having his photograph taken, and often dispatched lieutenants to deliver orders while he remained in his office. This was to play a part after the war. ww2dbaseAt the end of the war, Eichmann fled Hungary to Austria. He briefly visited his wife and three sons (Ricardo would not be born until 1955) to say farewell, and then disappeared into the mountains with a band of SS men. Although the Western Allies had not known his role in the Holocaust well, thus he was not yet high on the wanted list, his companions suspected what Eichmann had done and informed him that they no longer welcomed his presence in the party. Eichmann agreed with the group, drank one last drink with them to wish them well, and departed; only one man now served him loyally. Not long after that, however, Eichmann stumbled upon an American patrol and was captured. He used the pseudonym Otto Eckmann, something close enough to his real name so that he would be able to respond if called suddenly. He was interrogated by a number of American officers, and he increasingly grew fearful that he would not be able to maintain his secret forever. As security was minimal at the camp where he was held, he escaped with relative ease in early 1946. He made his way to Altensalzkoth in northern Germany and worked as a lumberjack. He had a girlfriend and lived a simple life, but he missed the days when he had a purpose in life. He also regretted not have set up secret bank accounts during the war in preparation of a time like this. In 1948, he obtained a landing permit for Argentina, where many former Nazi Party members had fled to; he did not use the permit immediately and remained in Germany. In 1950, he made up his mind to leave his country. Making use of a series of Catholic churches, he went to Italy. With the help of a Franciscan friar who sympathized with the former Nazi Party members, he obtained the pseudonym of Riccardo Klement, a humanitarian passport issued by the International Committee of the Red Cross, and an Argentine visa. On 14 Jul 1950, he boarded a ship heading for Buenos Aires, Argentina. ww2dbaseUpon reaching Argentina, the local German community, which was friendly toward former Nazi Party members, helped him with a job as a surveyor with a water company, which brought him to sparsely populated regions to help him hide. Over the following 10 years, he worked as a rabbit farmer and then as a factory supervisor, living modestly. In the 1950s, he also secretly arranged his family to go to Argentina, which tipped off some Nazi hunters who refused to believe that Eichmann had died at the end of the war at the hands of vigilante, as rumors had it. As indicated by document unclassified by the United States Central Intelligence Agency (CIA), German and American intelligence had clues of Eichmann being in Argentina as early as Mar 1958, but did not act because of West Germany's wish to focus on the future rather than the past, and that some high level German officials had links to the Nazi Party during the war (particularly with Hans Globke, who now held the position as the national security adviser; he had worked under Eichmann previously and helped to draft the 1935 Nuremberg Laws). ww2dbaseWhile Eichmann continued to use the pseudonym Riccardo Klement in Argentina, he refused to force his wife Vera and four sons to change their names; he had later claimed that he could not bear to have his family lie for him. This would prove to be a key to his capture. His son Klaus Eichmann became romantically involved with Sylvia Hermann who was the daughter of German Jew Lothar Hermann; Klaus did not know that Sylvia's father was Jewish. On one occasion at the dinner table at the Hermann household, Klaus voiced his anti-Semitic opinions and had claimed that his father was a high level German official who had connections with the war time German government. 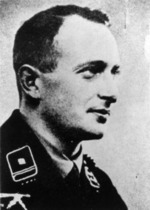 Based on Klaus' last name and the information that he had carelessly divulged, Lothar Hermann determined that Klaus' father was likely the wanted war criminal Adolf Eichmann. He contacted a German prosecutor, Fritz Bauer, who in turn reached out to the Israeli secret service Mossad. Sylvia also bravely risked her life in conducting her own reconnaissance operations to Eichmann's home in the San Fernando suburb of Buenos Aires to confirm Eichmann's identity. ww2dbaseOn 11 May 1960, in a covert operation, Israeli Mossad and Shin Bet agents abducted Eichmann as he walked home from a nearby bus stop; he was brought to a safe house while they awaited the flight that would secretly take him and part of the team to Israel. During the struggle at the time of the abduction, Eichmann's glasses were broken and fell to the ground, which gave hints to Eichmann's family the fate to Eichmann. His sons made an attempt to rally local Nazi-supporters and the German community to search for him, but were met with no success. The agents who abducted him and guarded him for the following few days noted that he was cooperative and meek; although he was unapologetic about what he had done, he was no longer the proud man that he once was when he was in power. The Israeli agents were able to persuade him to sign a document noting that he was willing to go with the team to Israel to face trial. This was important, as Israel had little to no right to try Eichmann; he was an Austrian/German citizen as Adolf Eichmann and an Argentinean citizen as Riccardo Klement, while the state of Israel did not even exist during WW2. He was sedated and disguised as an El Al airline employee on 21 May 1960 and was smuggled aboard a Bristol Britannia commercial aircraft for Tel Aviv, Israel via Dakar on the West African coast. When the news of the abduction broke on 23 May, Argentina officially complained the violation of her sovereignty to the United Nations Security Council; nationalist movements in Argentina protested by launching a wave of violent anti-Semitic protests and attacks. The government of Israel claimed that the abduction was done by Jewish volunteers who operated outside the knowledge of the Israeli government, but now since Israel was given custody of Eichmann, Israel was to try him in a court of law for crimes conducted against the Jewish people. ww2dbaseOn 11 Apr 1961, the trial against Eichmann began. He was accused of 15 major crimes, including crimes against humanity, crimes against the Jewish people, and membership of an outlawed organization. His defense was centered around the fact that he was merely following orders given to him from above. "I never did anything, great or small, without obtaining in advance express instructions from Adolf Hitler or any of my superiors", he claimed, but this statement did not collaborate with the statements given by former-Nazi party members who testified against him, all of which were done remotely from Germany or Austria. The trial also featured testimonies of 90 Holocaust survivors; Eichmann's defense team did not challenge the survivor's testimonies, but stressed that Eichmann was merely following orders without question as his war time duty required. The trial ended on 14 Aug. On 11 Dec 1961, the three judges presiding over the trial, Moshe Landau, Benjamin Halevi, and Yitzhak Raveh, declared him guilty on all 15 counts, although he was acquitted of several smaller charges within the 15 major ones. On 15 Dec, he was sentenced to death by hanging. Eichmann filed an appeal, which was rejected by the Israeli Court of Criminal Appeal on 29 May 1962. A number of requests for clemency were filed, including some from prominent people, as well as a telegram from Vera Eichmann, but all were rejected. On 31 May, Israeli President Yitzhak Ben-Zvi rejected a request for mercy from Eichmann. Long live Germany. Long live Argentina. Long live Austria. These are the three countries with which I have been most connected and which I will not forget. I greet my wife, my family, and my friends. I am ready. We'll meet again soon, as is the fate of all men. I die believing in God. ww2dbaseBut the exact wording remains debated. ww2dbaseAt a brief moment after the clock struck 0000 hours on 1 Jun 1962, the buttons were pressed. This execution was the first and remains the only civil execution ever carried out by Israel. ww2dbaseEichmann's body was cremated immediately, brought out to sea by ship, and scattered a few miles beyond Israel's territorial waters; this was to ensure that there would be no memorial place for the war criminal. ww2dbaseAdolf Eichmann is often referred to as "the architect of the Holocaust". 19 Mar 1906 Adolf Eichmann was born. 1 Apr 1932 Adolf Eichmann joined the Austrian branch of the Nazi Party as member 889 895. 26 Jul 1939 Adolf Eichmann was placed in charge of the Prague branch office of the German National Central Office in the Protectorate of Bohemia and Moravia, responsible for deportation of Jews. 4 Dec 1941 Adolf Eichmann appointed Jacob Edelstein, originally from Prague, the chairperson of the Council of Jewish Elders of Theresienstadt Concentration Camp in occupied Czechoslovakia. 11 Jun 1942 Adolf Eichmann met with representatives from France, Belgium, and Holland to coordinate the deportation of Jews. 19 Mar 1944 German troops occupied Hungary. Adolf Eichmann arrived in Hungary to begin mass deportation of the 750,000 Hungarian Jews who, thus far, had been largely unmolested. 16 May 1944 A transport of Jews from Hungary arrived at Auschwitz Concentration Camp in occupied Poland. Adolf Eichmann, in charge of all transports to the camps, arrived to oversee and speed up the extermination process personally. 24 May 1944 SS official Adolf Eichmann's office in Budapest reported that 116,000 Hungarian Jews had already been deported, and another 200,000 were awaiting deportation, most of which were from Carpatho-Ruthenia and Transylvania. 17 Oct 1944 Adolf Eichmann returned to Hungary. 18 Nov 1944 Adolf Eichmann ordered the deportation of 18,000 Jews from Budapest, Hungary to concentration camps. 23 Dec 1944 Adolf Eichmann fled Budapest, Hungary before dawn. 1 Jun 1962 Adolf Eichmann was executed by hanging in Ramla, Israel. This is a really cool guy I really like learning about him but I also hate the Nazi's they are very interesting but I hate them, they did horrible things to the jews. hahaha you actually liked Adolf Eichmann, whataaa freak. So is his name Otto or is it Karl? How can any man, plan the death's of millions and later say, "I didn't do enough!" how sick Justice...for him, was at the end of a rope. But how many thousands of Nazi's got away? I read in Arabic Wikipedia about a speech by Eichman regretting helping Jews survive the holocaust. And insulting Jews in many ways. I have not found any mention of the speech in any English reference. Has anyone heard about such a thing? I have read that too. I am looking also for the same speech in english. Fahad and Husam, did any one of you find any relevant source regarding Eichman's speech?? Karl Adolf was his father. 'Otto Eckmann' was the name he gave to the United States Army when they captured him as a POW. After he escaped the US, he into into hiding in italy under the name 'Ricardo Klement.' I find the history of the holocaust very interesting. I think my favorite thing, looking for a psych major stand-point, is how there is a group of thousands of men and a few crackpots wrote a couple of books, and all of a sudden there is an entire movement to anahalate an entire group of people. How incredibly aweful, but interesting. We know they were all sick, but also the fact that every single one of them went into the "extermination" process as sane is incredible. I have seen all the photographs of holocast and nazi leaders .it was a horrible situation which cannot be explained by any known language on earth. it is incompitent british, french ,and u.s. government who are also responsible for it. arvind ghosh calcutta, india, west bengal. eichmann should have hanged in auschwitz together with his ss men.
" He was approached by Hungarian Jew Joel Brand for possibilities to save Hungarian Jews, and the proposal that the two came up with was that Eichmann was to release up to 1,000,000 European Jews to the Western Allies if Germany was to be given 10,000 trucks and supplies of soap, tea, and coffee; the Western Allies ignored this offer." If the Western Allies cared so much about Jewish lives, was 10,000 trucks and some ration was too great a price to pay? Aye, the man was not pleasant, but he was not a monster too, he was not Reynhard Eindrich. He was just following orders, just like the men who dropped the bomb on Hiroshima. He tried to come up with a way to save lives, though that may not have been his primary motive. What would you have done in his place? Please answer that. DOES ANYONE KNOW WHEN THIS PAGE WAS LAST UPDATED?? PLEASE HELP.